Phew! What a couple of months it's been. I've done 2, count it, TWO! Full plays in 2 months on top of my 9-5 and girls let me tell you I am pure tired. 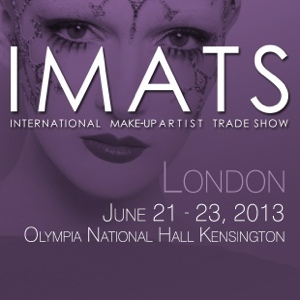 So what better way to celebrate a week off work than a trip to ole London Town for this weekends IMATS! After last year I can tell you I'm very excited and much more prepared for my IMATS experience. We are going to be a little less "deer in makeup wielding headlights" and a little more... Well just more lol. We're actually going to make it to some of the lectures & classes this time and we've given ourselves an extra day in the city to do some standard touristy stuff (no spoilers). Ahead of our flight tonight I'm in full holiday beauty prep mode. I'm primping, preening & de-fuzzing to within an inch of my life. Part of this exercise involves trying out some of the new Superdrug face masks currently on offer at 4 for £3. They're definitely trying to edge in on the Montagne Jeunesse market here, time will tell if they're successful. Also taking part in my regime is The Karités Hair Mask jam packed full of moisturising Shea goodness. I love this mask. It's £1.50 from Primark of all places! 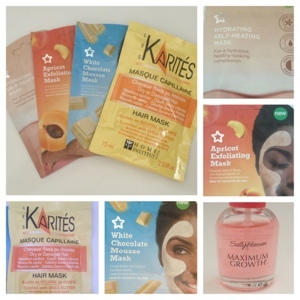 You get tonnes of product & it really gives a lot of moisture without going greasy. As you can see from the obligatory Sally Hansen still I'm also giving myself a wee manicure. I'm currently using their growth formula as a base coat as I hate my newly short nails & am desperately trying to grow out these flaws in order to be able to keep them long & show them off. It's a long term commitment but I'm determined. So that's my pre-holiday/event routine. I don't fake tan because, ugh, effort. But it's nice to feel a wee bit pampered before going away. Stay tuned to my Instagram, Twitter & Vine (all @Faeribex) & the same for @bexberry, find her over at www.bexberry.com, as i'm sure we'll be documenting every second in some form or another! We'll also be posting Hauls, FOTDs, OOTDs & general antics! Aren't you excited? I certainly am. 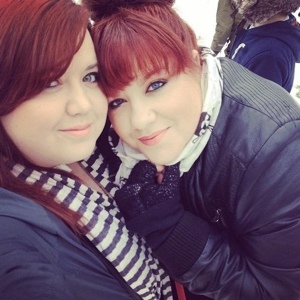 Bexberry & I outside last years IMATS during a very snowy January!